Sarah Allen grew up in a rural mining town in northern Canada – Flin Flon, Manitoba – a place known for its many lakes, dense forests and cold winters. Having the opportunity to spend so much time roaming the outdoors with her brothers and friends gave her a deep appreciation and respect for Canada’s vast water resources. Her love for the environment led her to get a Bachelor of Environmental Studies degree at the University of Waterloo. She went to Hanoi for 8 months’ work at the Centre for Water Resources Conservation and Development – a local NGO in Vietnam. This placement led her to complete her MA in Global Governance at the Balsillie School of International Affairs, University of Waterloo with a focus on trans-boundary water governance of the Mekong River. 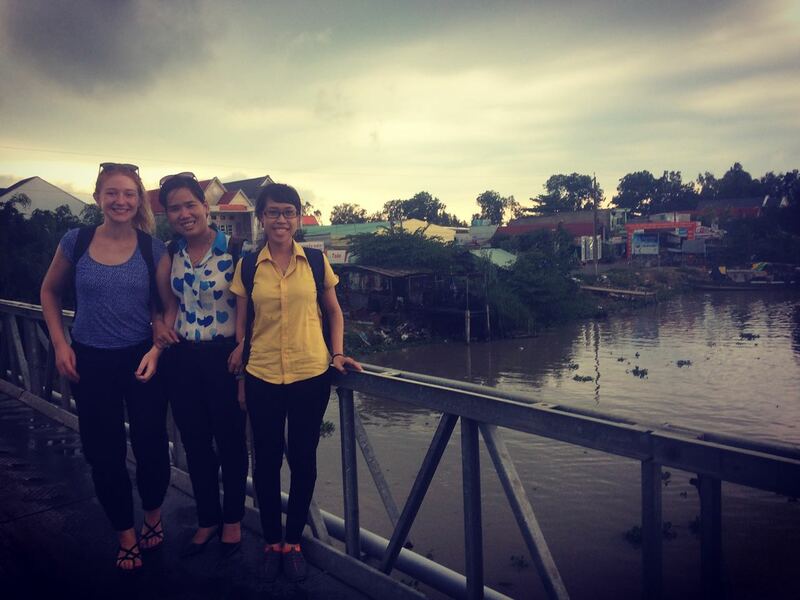 Her passion to learn more about water management and resilience issues in Southeast Asia has led her to take a position as a researcher at Chulalongkorn University in Bangkok. She discovered her love for conducting research and the opportunities that academia could bring. Her research examines the relationship between urbanization, water users and water security in Can Tho, Vietnam. Sarah uses urban political ecology to examine how power, water usage and distribution, and urbanization can influence water access in peri-urban spaces. “Peri-urban spaces are particularly interesting to me, because they are constantly changing and do not fit into traditionally urban or rural landscapes.” She continued by saying that people who are living in these spaces don’t necessarily have access to the same water resources as those in an urban center regardless of them living in a municipal boundary. So how does the study affect her view on good environmental governance in Vietnam? “Here (read: Vietnam) environmental laws exist that would allow for good environmental governance to be achieved. It’s not really a law or policy issue. On paper, they already exist – it comes down to enforcement and awareness in my opinion,” she said. Sarah continued by saying that proper enforcement is necessary to allow for proper mitigation to happen. But before enforcement can happen, those that should be doing the enforcing need to be aware of its importance. Ultimately, this comes down to there needing to be more than just economic and financial incentives involved for good environmental governance to be achieved. In terms of adaptation in the field, she thinks that for local people adaptation is already ongoing – they have been living in the changing conditions and are adapting day by day to their current situations. The international community would do well to learn from these examples. Sarah thinks this fact is often overlooked when trying to understand and find ways to create good climate change governance. She continued that there are so many factors that influence the likelihood of success. A true assessment of vulnerability needs to be done too in order to determine how national and city governments can work with what local people have already achieved in adaptability in order to move forward. Sarah hopes that her research can contribute to the baseline knowledge about climate change vulnerability and resiliency in cities. Particularly, in Vietnam, there is a lot of scientific data and information available but that information needs to go alongside social science research and analyzed together. “I hope that my research is able to bring some of this information together,” she concluded.